The Baekje Historic Areas cover 8 archeological sites from the late Baekje Kingdom (475-660 CE), with its unique culture. The remains are related to the three former capital cities of this kingdom: Gongju, Buyeo and Sabi. The Baekje Historic Areas cover 8 archaeological sites in 3 clusters, representing the 3 former capital cities of this historic kingdom. During my stay in Seoul, I visited the Gongju cluster on a day trip by public transport. It was my first experience with Korea's long-distance bus system since my earlier visit in 2001, and it was a real pleasure to be transported on-time for only 7.20 EUR on a luxury coach with wide and comfy seats. It took 1.5 hours from the Seoul Express Bus Station to Gongju Bus Station. Gongju nowadays has an odd city plan, with the river splitting it in two. A quick look at this provincial city proves that not everywhere in South Korea is as modern and prosperous as Seoul. The two components of the WHS are clearly visible from afar, each covering a hilltop near the river bridge closest to the city center. I first walked to Gongsanseong fortress. As I had spent the day before at Namhansanseong, I couldn’t bring up much enthusiasm for yet another Korean fortress. The flags are yellow here (“the national colour of Baekje, representing the center of the universe”), the walls steep and the main area without much sites of interest. Very little reminds of the Baekje area: the absolute low point is the “Site of Baekje Building”, which is just a flat piece of grass land. After half an hour or so I decided to move on to the second component of the WHS and the renowned Gongju museum. As said, this part is also clearly visible on a hill – but how to get there? I went on foot from the fortress, and quite nearby there’s a sign pointing to ‘Jeongjisan Archaeological Site’. However I ended up in a residential area with fiercely barking dogs, and never found any access to the WH area from this approach. I had brought a sketch of a map with me, and it seemed to show the main entrance of the complex to the back of the hill. So that meant another rather long walk on the Gongju pavements. Finally I ended up at the Royal Tombs of Songsan-ri. The area seemed deserted, but when I approached a ticket seller lifted the shutter of his booth and sold me a ticket. Then a trail awaits along the underground exhibitions and the tumuli outside. The interiors of the tumuli are all closed off nowadays, so the underground exhibition is the only way to admire the creative, Chinese inspired way of burial chamber design of the Baekje. 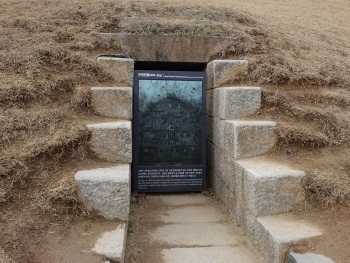 Undoubted highlight is the tomb of King Muryeong: it looks as if he was buried in a book case! The outdoor area is nice enough for a short stroll, but doesn’t bring more than a series a grassy bumps that cover the original graves. The trail along the tumuli ends at the far end of the archaeological area, and that’s where the entrance to the Gongju Museum lies. It’s a gigantic modern building. At the entrance I’m overloaded with free brochures, including a map of the whole Baekje area (including the other former capitals next to Gongju). The main hall on the first floor is dedicated to the findings from the Songsan-ri tombs. The most impressive one is that of the aforementioned King Muryeong. He and his wife were buried with many of their possessions such as weapons, tableware (from China), jewelry and shoes. A couple of the exhibits are currently away on loan to the National Museum in Gongju, where I had also admired them about a week ago. So that’s all there is. I must say that the museum exhibits and the underground reconstruction of the tombs were the most impressive. There’s not much left of the structures that the Baekje built. For future visitors to Gongju and both WH locations, I’d like to suggest taking a taxi or local bus (101 apparently) from the bus station to the Gongju National Museum. I walked everywhere, and especially the way back from the museum to the bus station across the river is tiring. I visited this WHS in April 2017. Out of the 8 locations spread out in Iksan, Gongju and Buyeo, I chose to visit the 4 different locations in Buyeo, namely the Royal Tombs of Neungsan-ri, the Naseong City Wall, the Archaeological Site of Gwanbuk-ri and Busosanseong Fortress as well as the Jeongnimsa Temple Site. From what I had read about the Baekje inscription what struck me to be of OUV were the different stone pagodas and peculiar Buddha Statues. Gongju lacks these elements and at the moment the most interesting stone pagoda in Iksan is being restored so I opted for Buyeo, which also has an interesting fortress, an overgrown city wall and older Baekje painted royal tombs (photo). To get to Buyeo I took the subway to Seoul's Nambu Bus Terminal and bought an intercity bus ticket to Buyeo Bus Terminal. This same bus went to Gongju which is only a few kilometres away but I had quite a lot of ground to cover in Buyeo so I never made it to Gongju. The public transport system in South Korea is really convenient and efficient and although I'm certainly not a fan of public transport usually, I was really impressed by the service given overall. Once I arrived at the Buyeo Bus Terminal, I decided to catch a taxi (around 4 euros) instead of waiting for another bus (number 701 or 709 to Wangneung Parking Lot Bus Stop) to get to the Royal Tombs of Neunsan-ri and the Naseong City Wall. Here you will immediately see the UNESCO WHS plaque near the bus stop. For some reason related to Spring celebrations, entrance was free of charge. There are 7 royal tombs of different kings from the Baekje period. The Donghachong tomb or tomb number 1 has a painted ceiling with lotus flowers and a cloud pattern on the ceiling (photo) with murals of four deities. Over time, the paintings started getting discoloured so the original tomb was closed and the interior of a replica tomb can be seen just a few metres away from the Naseong City Wall. 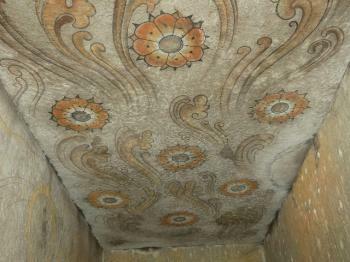 The painted tombs of Tarquinia came to mind although the Etruscan tombs are older and much more intricate and colourful. There's also a poor museum with a few information boards just before you get to the Naseong City Wall. What is considered to be one of the earliest examples in East Asia of a structure built far outside a city to serve not only as a defense structure but also as a symbolic boundary between its interior and exterior, is now an overgrown mound or rubble wall which is being restored and cleaned up. After catching a bus back to the city centre, I walked to the Archaeological site of Gwanbuk-ri and the Busosanseong Fortress located on a small hill. Apart from the Nakhwaan rock pavilion which is believed to be the site where 3000 Baekje ladies committed suicide by jumping off the cliff and a few remains, there isn't much left to see. However, important clay figurines, Sarira ports and jewellery were found here and are usually on display at the nearby Buyeo National Museum (closed on Mondays). Luckily I got to see these Baekje remains together with important finds from Gongju and Iksan a few days later at a temporary special exhibition on Baekje heritage at the Gyeongju National Museum (7th March till 7th May 2017). It was great to be able to compare the few Baekje remains with the wealth of Silla remains in the same museum. 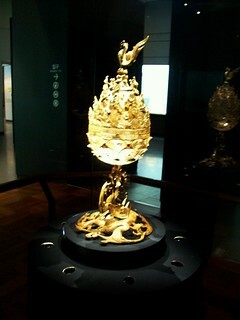 The definite Baekje treasure highlight was the Gilt Bronze Incense Burner which was only discovered in 1993. The pedestal is crafted in the shape of a dragon, the main body of the incense burner is intricately adorned with different musicians and the top cover is decorated with a legendary bonghwang bird. It is an excellent example of Baekje art and shows how they mastered advanced metal casting techniques. Another important treasure found in Buyeo, Iksan and Gonju were the gilt sarira reliquary pots often made of gold, silver, bronze or glass with gold caskets, jewellery and gold plates with inscriptions on the sarira enshrinements. The best examples were those from Busosanseong Fortress in Buyeo and that at Wanggungri which is normally displayed at the Mireuksa National Museum in Iksan. Last but not least I visited the Jeongnimsa Temple Site which is the closest site to the Buyeo Bus Terminal. What is left of what was once a huge temple is an 8.3 metre five-tier stone pagoda (Jarek's photo), one of two remaining from the Baekje period (the other being that of Mireuksa), and a peculiar seated Buddha statue with a 'cap' from the Goryeo period. There is another peculiar 10 metre high standing Buddha statue with honarary "headgear" at Daejosa Temple which is worth visiting together with Gungnamji Pond if you have more time in Buyeo (there's yet another one in Nomsan at Gwanchoksa Temple, all showing great influence from China). The Jeongnimsa Temple Museum is worth visiting if only for the permanent Baekje special exhibition on the first floor with the UNESCO WHS inscription certificate on display. Overall with a lot of research and luck with the special exhibition in Gyeongju National Museum, I managed to appreciate the quite niche OUV of this recently inscribed WHS. Less Baekje treasures have been found when compared to those from the Silla Kingdom however I felt that there are much more tangible heritage Baekje sites when compared to those from the Silla period which are mainly tombs/mounds (except the astronomical tower and the incredible Namsan rock carvings). November 2016. The whole site is divided into 3 different clusters. Due to reconstruction process at Mireuksa Temple I decided to focus on Gongju and Buyeo areas. Gongju - two different sites: Gongsanseong Fortress and Royal Tombs in Songsan-ri. At first do not buy combine ticket to the sites - separate are a little bit cheaper (local Gongju Archeological Museum mentioned on a combined ticket may be visited free of charge). Gongsanseong Fortress - well preserved fortress walls but there is not much inside (only a few reconstructed temples or pavilions). Some reconstruction works are still in progress (including huge area around Lotus Pond). Not to be missed - nice views of a city from different spots while strolling on the walls. Buyeo - Busosanseong Fortress - much bigger than the fortress in Gongju but also less preserved (at least the walls), also contains some (mostly) reconstructed buildings (temples). Do not miss Nakhwaam Rock (the cliff of falling flowers) where royal ladies of Baekje Kingdom jumped off to kill themself during the invasion of Shilla army. Allow at least 2 hours as the area is quite huge. In the lower part of the fortress (to the south) there are remnants of different temples and palaces of Baekje Kingdom. Jeongnimsa Temple - located in modern Buyeo, around one km from the fortress - contains relicts of old buddhist temple from Baekje period and a real treasure - five-storied stone pagoda (comparing to Mireuksa this one is standing). Royal tombs in Neungsan-ri - around 3 km from Buyeo city center - the same situation as in Gongju - the real tombs are sealed and closed for visiting while full scale reconstructed tombs are open for tourists. Comparing to Muryeong tomb all these are more colourfull. Naseong city wall - originally covers the whole area of Buyeo - currently there are huge works towards restoration / reconstruction the site. From Royal tombs in Neungsan-ri it goes to the north (towards the Busosanseong Fortress) although I am not sure which part was reconstructed. It also goes to the south (certainly climbs the nearby hill towards Geum river). Both cities (Gongju and Buyeo) are easilily connected by very frequent buses (less then an hour), also they are both connected to major Korean towns (Seoul, Suwon, Daejon). The two most important sites in this serial property are the Tomb of King Muyeong and Mireuksa Temple. The famous tomb, which was discovered intact, became one of Korea's most famous archeological discoveries. The tomb included items from Southeast Asia, China, and Japan. The interior of the tomb can only be visited by an onsite replica. Like Kaesong and Gyeongju, this WHS is made up of mostly tombs, fortresses, and temples. The fortress in Gongju and Buyeo are both pleasant walks, but have been partially rebuilt in later historical periods. I am very interested in visiting the Naesong City Wall, which (to my knowledge) was never rebuilt following the Three Kingdoms period. While Gongju and Buyeo are very easy to visit, it gets more complicated in Iksan. First and foremost if you visit Iksan hopefully it's by car, as these sites are spread out and only few of them are accessible by bus. I visited Mireuksa temple site, and the Wanggung-ri Palace site. These historic areas really feel like archeological sites. There are few remains, but fascinating nonetheless. Interestingly enough the famous and enormous Mireuksa 5-story pagoda (originally 7-story) no longer exists in a sense. Pretty much the only major remain at the site, Mireuksa pagoda has been dismantled to strengthen the base and back portion. So what you see is a huge building over a largely disappeared pagoda. The original stones are numbered and laid out over an area the size of a basketball court, all properly numbered and waiting to be put back together. (Very much like a jigsaw puzzle) The pagoda was in serious danger of collapsing under its huge weight, so I think the current plan is the best option. 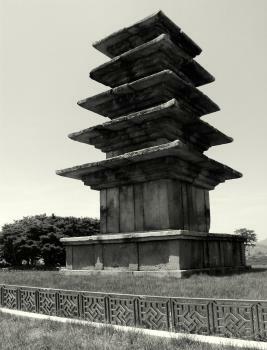 Mureuksaji was likely the largest temple in Korea, and the pagoda is the largest. The Japanese in 1915 built concrete supports at the back of the pagoda, helping the pagoda last another hundred years. When the pagoda is put back together it will be whole for the first time in about 400 years. 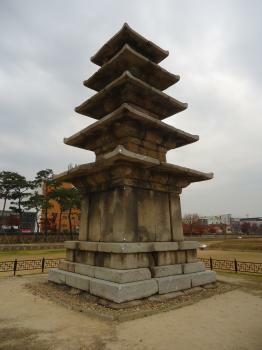 The pagoda dates back to around 600 AD, likely the oldest stone pagoda in Korea. The Wanggung-ri palace site is almost completely gone with only another stone pagoda (5-stories high), and some small stone pillars, foundations, and wall structures remaining. (Much of the site is closed for archeological studies) In the Iksan area alone there have been more than 19,000 Baekje artifacts already unearthed. The sites in Iksan are interesting, but most visitors will come away somewhat disappointed if you don't also visit Gongju or Buyeo. I would recommend visiting some of the excellent museums to add value to the sites. Baekje mostly demonstrates its OUV because of its connections and how it came into contact frequently with Japan and China along its coastal areas though trade and regional dominance. (Noteworthy is Baekje's influence on ancient Japanese kingdoms) I am happy to see the Baekje Historic Areas become Korea's 12th world heritage site. In so doing, it completes the representation of Korea's many dynasties on the list. Built or owned by Japanese: Mireuksa Temple Pagoda, in 1914 the Japanese government supported it with a concrete backing.